Item Nr: B 96330 Title: Can You Listen With Your Eyes? 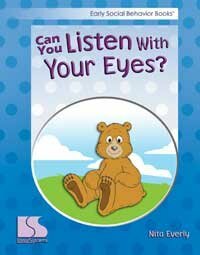 This interactive story explains whole-body listening in a way that makes children want to focus in and ready their bodies for listening. Desirable behaviors are broken down into small steps so children can attend and learn quickly. From the series Early Social Behavior Books. For use with children 3-6 yrs.